Thinly sliced chicken breast, marinated in a punchy mix of paprika, ground cumin and ground coriander. Fry it up with lots of sliced onions and peppers. 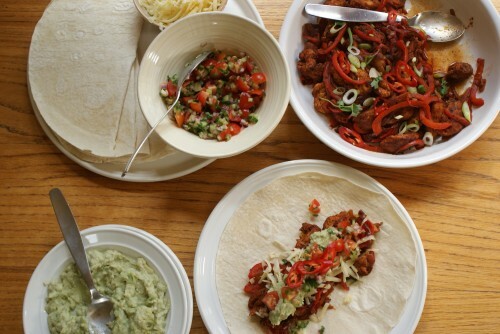 Load this onto your tortilla, top with some grated cheese, guacamole, a fresh and zesty salsa and a big dollop of soured cream (or yoghut). Then roll it up and stuff it into your mouth – be prepared for a bit of a mess. Put the chicken in a freezer bag and sprinkle over the spices.Close the bag, massage the spices into the meat and leave whilst you prepare the rest of the vegetables. Ideally, you’d leave it overnight to marinate in the fridge. Heat a large frying pan with a little oil, add the peppers, onions, garlic and chilli and cook over a high heat until softened. Remove from the pan and add the chicken, cook for 5 mins or so until browned. Add the onions and peppers back to the pan and cook for another few mins. Season well. For the guacamole, scoop the flesh out of the avocado and mash well, add the garlic, juice from the lime and yoghurt and stir well. Season well. 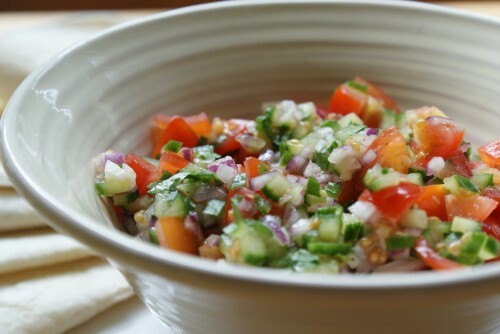 For the salsa, simply mix the tomato, onion, cucumber, coriander and garlic together, squeeze over the lime juice, drizzle over the olive oil, season with salt and pepper and stir well.